ACE Blog | Blogging about the world of crafts and crafts of the world. We’ve got some very exciting news to share! Not only will ACE have a new location in 2015, but the show will be moving to a new weekend – Friday, September 25th through Sunday, September 27th. 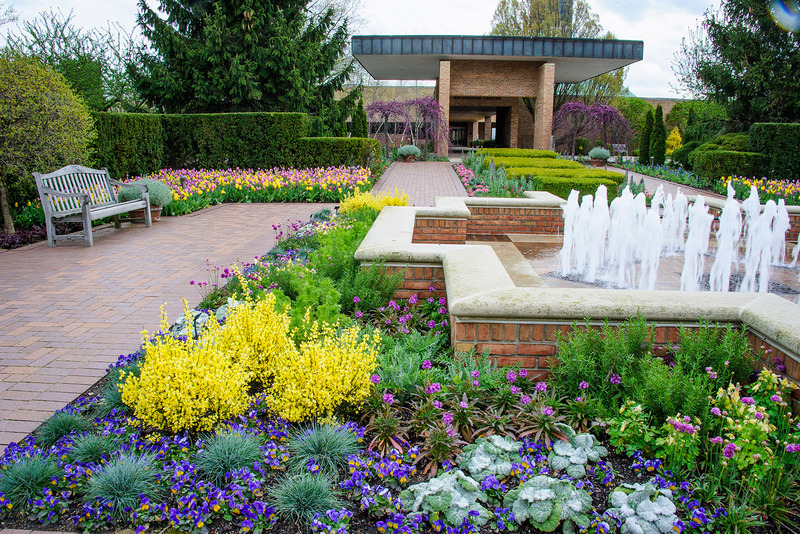 Please be sure to save the date and help us celebrate the 31st Anniversary of the American Craft Exposition in its new home, the world-renowned Chicago Botanic Garden! Our fabulous Benefit Preview Party will kick off the festivities on Thursday evening, September 24th. 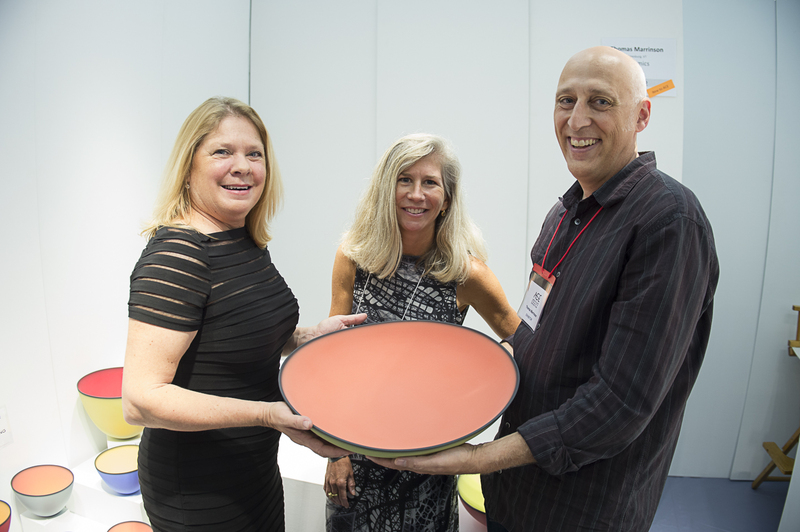 2015 ACE Co-Chairs Liz Dauten and Deb Kerr with Gustavo Rodriguez, MD, NorthShore University HealthSystem. Presented by The Auxiliary of NorthShore University HealthSystem (NorthShore), this juried exposition and sale of fine craft features one-of-a-kind pieces, luxury collections and uniquely creative artwork from the country’s finest craftspeople. Now celebrating its 31st year, this highly anticipated event gives guests the opportunity to appreciate and purchase stunning artwork while supporting pioneering ovarian cancer research at NorthShore…all in a beautiful new setting! 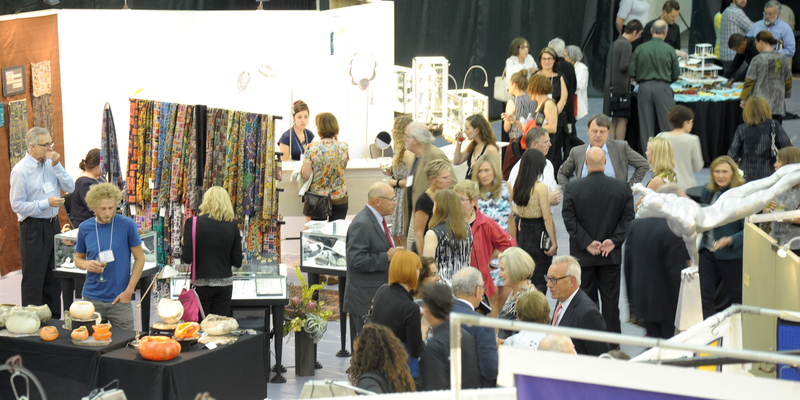 We would like to thank everyone who came out to the 30th Annual American Craft Exposition (ACE). 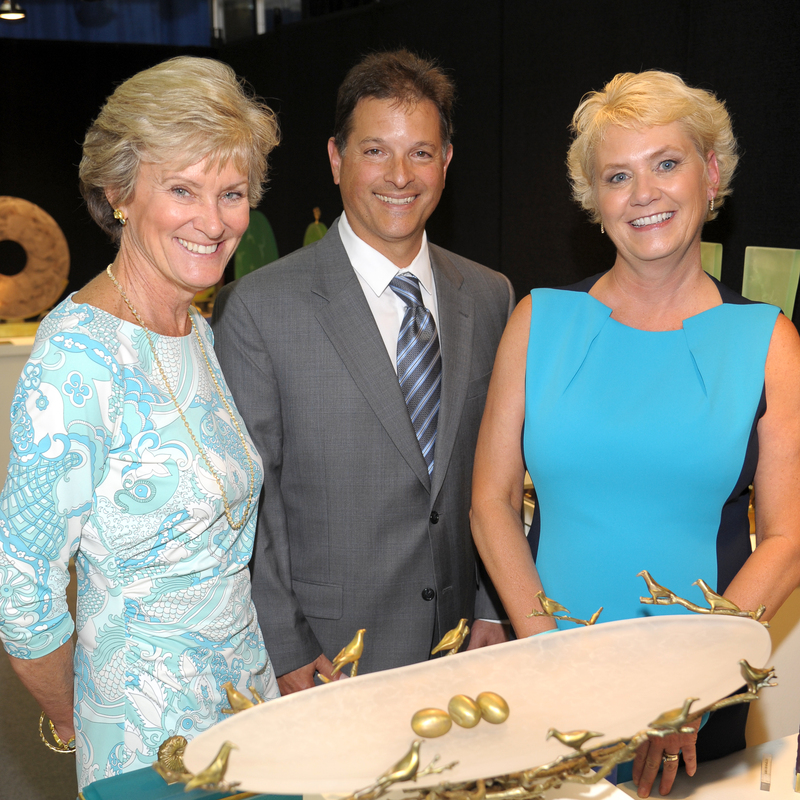 Over 6,000 supporters attended this year’s ACE, which raised more than $240,000 to fund pioneering research at NorthShore University HealthSystem that is already showing promising results in preventing ovarian cancer in at-risk women. Without the support of our sponsors, volunteers, artists and attendees, this tremendous fete would not have been possible. Whether you joined us at our Benefit Preview Party or the Craft in Action Stage, we hope you had a chance to enjoy all of our unique event offerings. Stay tuned for exciting updates as we plan for ACE 2015! 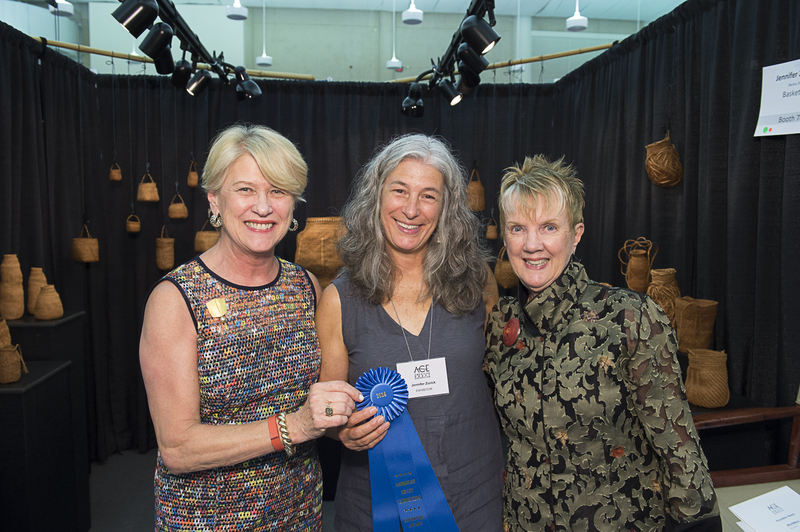 The American Craft Exposition (ACE), presented by The Auxiliary of NorthShore University HealthSystem (NorthShore), uses its passion for art as a way to gain awareness for ovarian cancer research. 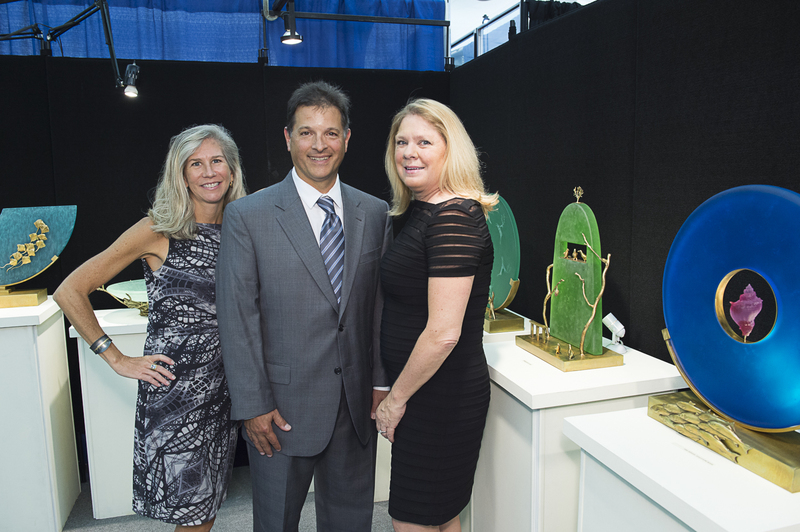 By bringing together hundreds of the country’s most renowned and skilled artists, ACE not only functions as an art exhibition, but also as a fundraiser supporting critical ovarian cancer research at NorthShore. 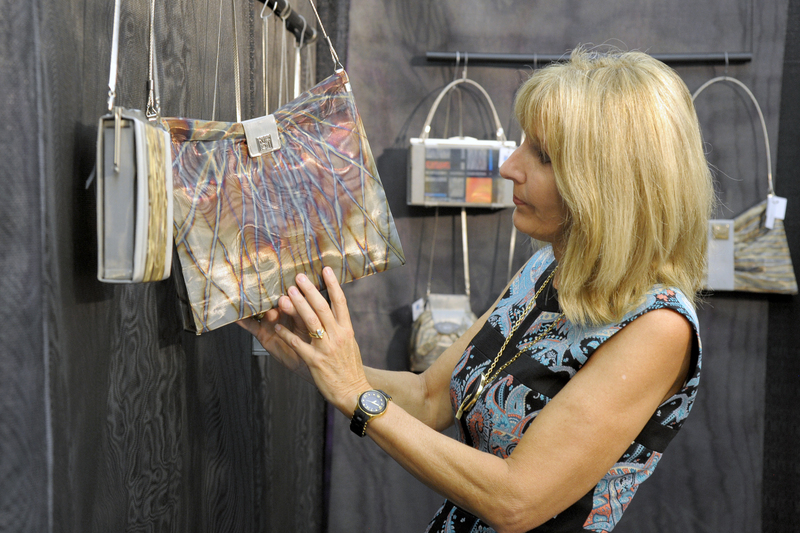 A number of artists at this year’s event have volunteered to participate in ACE’s “Craft for a Cure” program, agreeing to donate a percentage of the sale of a designated item to ACE’s funding goal. 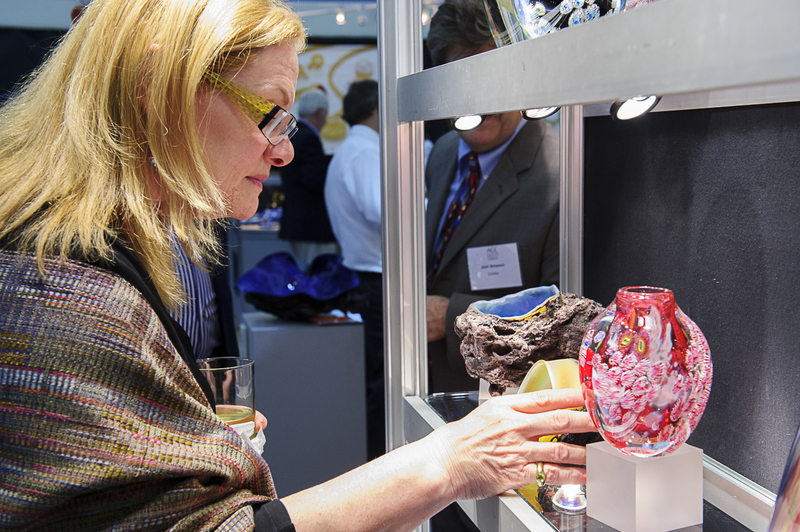 The following list details the artists who will be participating in “Craft for a Cure.” Visit their booth at the show! We are also grateful to the many artists who have made generous donations to our raffle and online auction. Funds raised at ACE 2014 will support pioneering research at NorthShore that is already showing promising results in preventing ovarian cancer in at-risk women. Ovarian cancer is often called the “silent killer” because symptoms are easy to dismiss and the disease is often diagnosed too late for effective treatment. However, research from Gus Rodriguez, MD, and his team have found that using routine use of the combination estrogen-progestin oral contraceptive pill results in a remarkable 30-50 percent reduction in the risk of developing not only ovarian cancer, but also in endometrial cancer. New Pieces Ready for Debut at ACE! I spent most of June and all of July making new pieces for the ACE show. And now it’s August and I’m still making work at a pace that sometimes surprises me. I’ve made three flip rings so far. 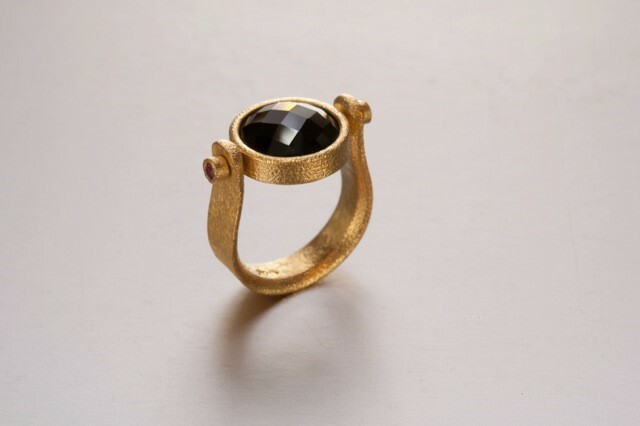 These are rings based on ancient Roman and Greek jewelry where the center stone rotates within a stirrup shaped band. I’ve combined red spinels with black spinel, black diamonds with jade from New Zealand and black diamonds with a beautiful Ceylon moonstone. I’ve always been excited by crystals especially if the color is really bright. I’ve made two pairs of earrings like this. 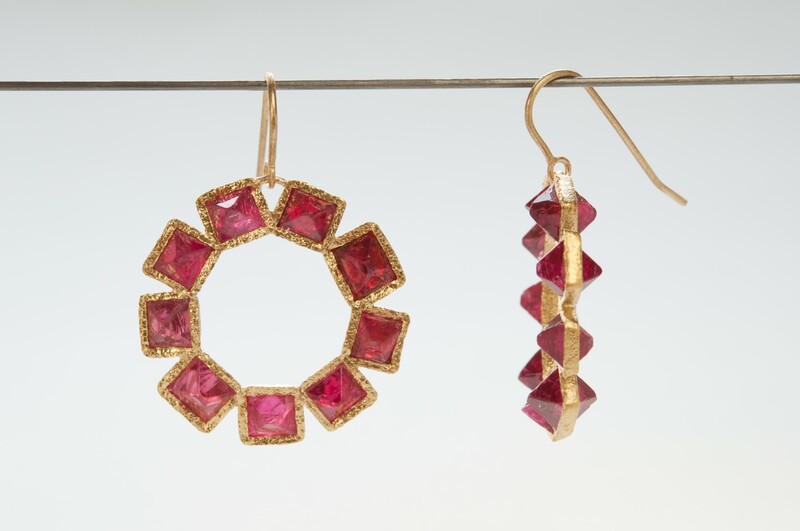 The first uses red spinel crystals from Burma in a circular pattern and dangles from the ear. It’s enthralling how the light comes through the crystals when they’re being worn. The second pair is also circular and employs super bright diamond crystals. These are sliced off the tip of a diamond crystal called a dodecahedron and if I hadn’t gotten to them first they would have been cut into traditional diamond shapes! They are really bright and sparkly. Both of these earrings are set in 22 karat gold which gives a rich counterpoint to the crystals. At the Tucson Gem Show last year I was able to find some polished sections of a meteorite that had landed in Russia. I’ve made earrings and rings with this fascinating material. They have a lot of iron in them and this gives a shiny silvery contrast with the darker olivine. It’s crazy to me that these minerals were in a liquid form in outer space and then solidified when they entered the earth’s atmosphere. 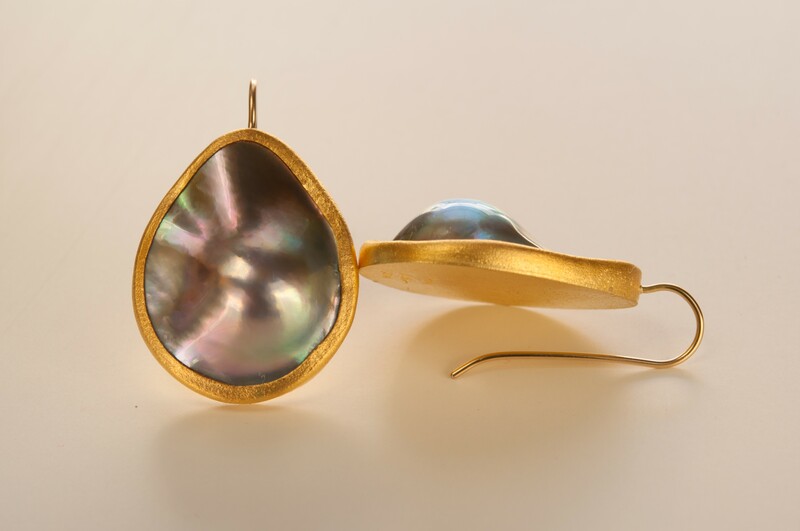 At the Tucson Gem Show this year I found some mabe pearls grown in Mexico in the Sea of Cortez. They have a dark grey body color with an iridescent sheen. They look great as earrings and I have one large ring that is stunning. 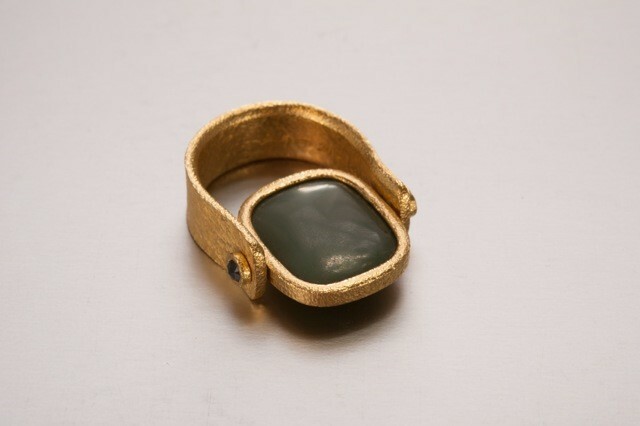 There are two types of jade: jadeite and nephrite. Jadeite is the rarer of the two and comes in a variety of colors including the bright apple green that is so highly prized. Nephrite tends to be a darker green and also can be an appealing black. I grew up in New Zealand and have frequently used the nephrite that is so abundant there. This year, again at the Tucson Gem Show, I found some fine jadeite that is a rich, almost emerald green and have made that into a sweet pair of earrings. I also have two jadeite rings. I just finished a necklace that uses a variety of ancient beads including turquoise, carnelian, blue chalcedony, coral, rock crystal and jade. The sources range from Tibet to the Near East to South America. The beads range in age from 500-200 years old and together create a wonderfully colorful necklace. It’s been a very productive time for me and I’m not finished yet! I’m so excited to be doing the ACE show which has always been one of my favorite shows to do. I hope to see lots of old friends and new ones too August 21-24. A special thank you to ACE artist Devta Doolan for this guest post. Purchase Your ACE Tickets Today! Friday, August 22, 2014 10:00 a.m.–8:00 p.m.
Saturday, August 23, 2014 10:00 a.m.–6:00 p.m.
Sunday, August 24, 2014 11:00 a.m.–5:00 p.m.
After August 18, general admission tickets will be available for purchase at full price ($15) by calling 224.364.7270 or at the door. Click here to purchase your ticket today! What better way to peruse and purchase one-of-a-kind works of art than at the ACE Benefit Preview Party? Enjoy gourmet appetizers, desserts and cocktails while getting a first glimpse of the show before it opens to the public. The Preview Party takes place Thursday, August 21 from 6:30 to 9:00 pm. Tickets cost $150 and include admission to the three-day exposition. 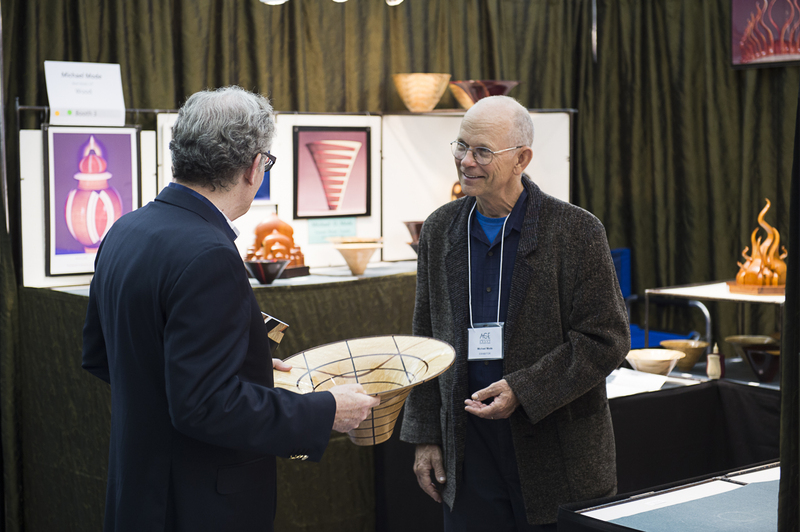 For those art aficionados looking for an intimate shopping experience, the Collectors’ Hour provides a first look at the incredible items available for purchase at this year’s show. The Collectors’ Hour begins at 5:30 pm on Thursday, August 21 – an hour prior to the Preview Party opening. Tickets cost $200 and include admission to the Benefit Preview Party and the three-day exposition. Click here to purchase your Benefit Preview Party or Collectors’ Hour tickets! Looking for a fun and unique outing to take with friends? Come to ACE with a group and take advantage of our “Friends of ACE” promotion. Purchase 4 tickets now for you and your friends and receive each ticket for only $10! Tickets can be purchased here!